Indianapolis Pest Control has found that one of the most stressful problems home owners face, is the problem of dealing with the pests that invade and destroy homes. These household pests can be plants, animals, insects or germs, that disrupt you from normal activities or quality of life. Some examples of this are rats and mice, cockroaches, aphids, and much more. These insects, organisms, or animals can pose a real danger by inflicting poisonous bites, or they can cause damage to your property. To get rid of a serious insect problem, consider hiring Indianapolis Pest Control services. Pest control is, by definition, the eradication and removal of pests so that they can no longer cause damage to your home or health. The first step in quality pest control in Indianapolis is, to definitively find out what type of pest has invaded your home and how it’s getting in. Through this process, we will be able to gauge how harmful the pest is to you and your property. So how do you determine what kind of pest is present? Well, pests can be identified by the marks they leave, their excrement, or by visually seeing them during the pest inspection stage. After this, you need to be ready to take action to eliminate them and any other pests discovered. To keep from attracting them in the future, you first need to reduce your home’s clutter by gathering up newspapers, paper bags, cardboard and bottles and recycling them. You should also prepare for a very thorough house cleaning. Use a vacuum with a HEPA filter. When you’re done, seal the vacuum bag in plastic and dispose it properly. A simple way to get rid of wild animal pests is to seal any external holes, missing siding, or damaged soffit. Narrow gaps found in showers, sinks, and cabinets can be sealed with caulking. Food also increases the attraction of pests. Be sure to keep all food in sealed containers, and left-over food must be placed in the refrigerator. Cookie crumbs, crushed chips on the floor, or spilled food that wasn’t properly cleaned up is an open invitation for cockroaches and mice. 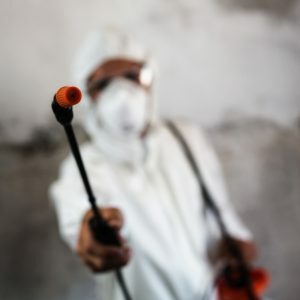 Lastly, you need to look for and find the appropriate pesticide for use inside in your home if you’re going to try to eliminate the pests yourself. If this makes you uncomfortable, give us a call at (317) 664-7873 to have them completely eradicated. It may be time to hire an exterminator like Indianapolis Pest Control, to help out with your pest problems. What Can Our Leading Indianapolis Exterminator Services Deal With? Mosquitoes – These nasty pests are most active around dawn and dusk, but they may also seek a host throughout the day and at night. They love backyards throughout Indiana, especially if your backyard is wet, & they frequently pester residents by feeding on their blood. Mosquito bites itch and cause discomfort for several days. These insects can also put people at risk for the West Nile virus. Cockroaches – Indianapolis hosts about five different species of cockroaches. Not only do these insects contaminate food and surfaces in homes, but cockroach infestations can also trigger asthma symptoms since allergens produced by these pests affect hundreds of Indiana residents. Bed Bugs – In large cities, like Indianapolis, it’s easy for bed bugs to get around. They get into homes on used furniture, luggage, or many other ways. Once the insects infest an area, it usually takes a professional pest control company like us to get rid of a bed bug infestation. Having knowledge of the signs of a bed bug infestation is extremely important so you know when to call the professionals. Blow Flies – Rotting food or carcasses attract blow fly swarms. When they get inside homes, the pests contaminate every surface and food item they land on. Large numbers of blow flies found indoors are serious indicators of a dead animal trapped somewhere inside the house. It’s common to see dead blow flies in light fixtures. This is a good indication of their activity somewhere inside your house or attic. These are just a few of the many pests we can deal with. In fact, we can help you get rid of just about ANY unwanted pest that’s invading your home or business! That includes things like rodents, ants, ticks, termites, birds, fleas, general wildlife, and more. Give us a call today at (317) 664-7873 and find out exactly how we can help you with your pest control needs. Here at Indianapolis Pest Control, we’ll work hard with you to create an environment inside of your Indianapolis business that won’t attract pests. Through our integrated pest management service, we’ll help you completely eliminate your current pest problems and work to solve the root of your business’s pest issue(s). Call Indianapolis Pest Control today at (317) 664-7873 to learn more about how we can provide a long-term solution to keep pests out of your business.